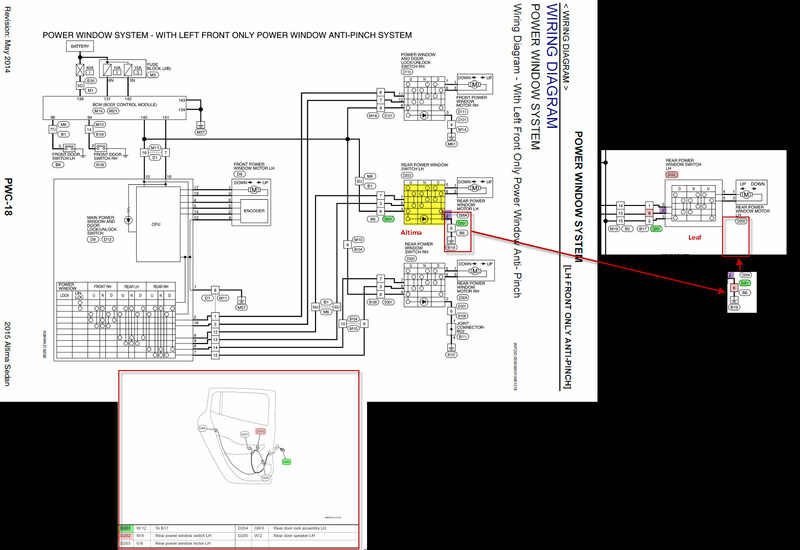 the pinout is slightly different for whatever reason.. the fix might be to repin the plug? Correct the REAR Altima buttons do not work. !!! do not use rear altima lighted buttons. FRONT Are fine, but not rear. trust me, dont try it. i connected them and noticed that the switch board itself got really HOT. see i connected it and tested it before reinstalling the trim and putting it back. i noticed right away that they did not light up, so i then holding the harness in my hand felt the switch board itself and it was HOT HOT..i quickly disconnected it and turned off the car and then reinstalled the OEM non lighted rear switches. everything is working fine on the fronts but as the Nico club manual explains, the wiring is different. since i have the switches i will look at repinning when i get time. so, i need the electrical engineers to confirm, but from the Altima FSM and the Leaf FSM it looks like we need to re-pin the D202 harness before we connect an Altima rear lighted window switch. so from this image below it looks like we need to swap pin 8 and 2 on the D202 harness on the LH door and then the new pin 2 of the D202 with the Altima switch installed in the leaf needs to be sent to ground? can anyone confirm by reviewing the FSM images please? the altima has an extra ground on pin 2 that you may need to add somehow and is missing on the leaf, i believe is the ground for the little led light. hopefully the pins come out of the connector without a super special tool. thank you, i think your right. i think your also right about the pin 2 being the LED light ground but i scoured the FSM and i couldn't find what that symbol meant shown in the pic...the circle triangle symbol at pin 2. im guessing thats the LED symbol. Good tips on the lighted switch from a Maxima or Altima; has bothered me the last month with it getting dark early. Has anyone looked into whether it would be possible to flip the window motor/regulator from the front drivers side over to the passenger side so that we can get the encoding there for a function passenger auto down/up? Or if any other models w/ a front passenger regulator/motor w/ encoding would work on the Leaf? So, just to be clear, the 2013-2016 Altima, lighted driver side switch assembly (w/o auto passenger window = base model) and Altima passenger lighted window switch will fit the 2011 to 2016 Leaf? Does anyone have clear part numbers of OEM parts to order? Thank you! testmonkey wrote: So, just to be clear, the 2013-2016 Altima, lighted driver side switch assembly (w/o auto passenger window = base model) and Altima passenger lighted window switch will fit the 2011 to 2016 Leaf? OEM master switch was about $300! I ordered a used one for $37. FIngers crossed! what you got from the description sounds right though, should work. sounds like passenger switch is one rev up, hopefully that is not the encoder version.